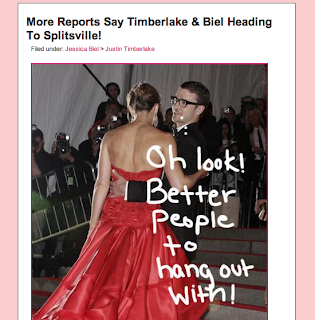 I got back to my apartment to notice this little gem on PerezHilton.com (sorry, I can't just quit him... have to ween myself off). People, do you realize what this means? There might soon be a single-and-mingling JT on the streets of LA. Score!!! And sorry to Jessica. But seriously? I'm not too sorry. We went upstairs to the party and the DJ was spinning really fun songs. The whole night we couldn't stop singing "To the window, to the WALL!" because of Lauren so when it finally came on we were ecstatic. I crashed around 2:30 but everyone else was in full on party mode I think until like 4:00. Girlfriend had to get some beauty rest because the good Lord knows I need it. Anyway, tonight is going to be chill. I'm going to lay out with the girls and then we're watching the first season of True Blood. And I can't wait for this upcoming week because Lauren is taking us all to Staples for the Beyonce concert!!!!!! ahhhhh!!!! I'm so thrilled. Her grandpa has a box so fun should be had by all.